Believe it or not, it was the food from Lollapalooza that inspired me to make this salad. I had a version of this dish from the Franks n’ Dawgs stall that was one of the best things I ate all summer. As a born-again sprout lover (like most kids, I hated them), I am always up for inventive ways of utilizing this ingredient, and this one really delivers. The uncooked sprouts lend a great texture to the dish, and I think you can certainly play around with the dressing. I used a more vinegar-based version than the one I ate at Lolla, so I say go with what you like best. Not sure I’d want to shave the sprouts with a knife (I don’t trust my knife skills), so I used a cheap ceramic mandoline slicer and the work was done in no time. Mix to combine and coat the vegetables with the dressing. This can be done up to a day in advance, and you can use a creamy dressing similar to one you might use for coleslaw – the flavor profiles of cabbage and sprouts are very similar. 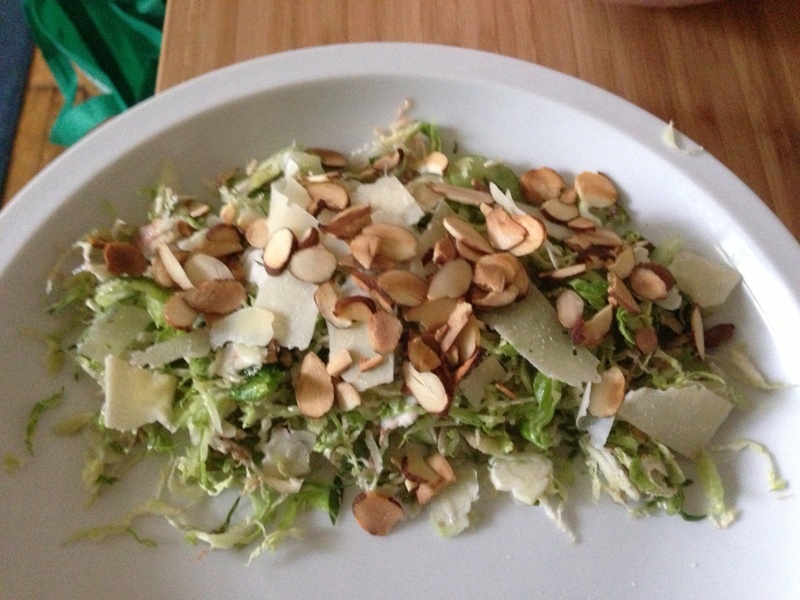 To serve, I topped with toasted shaved almonds and shavings of Parmesan cheese.